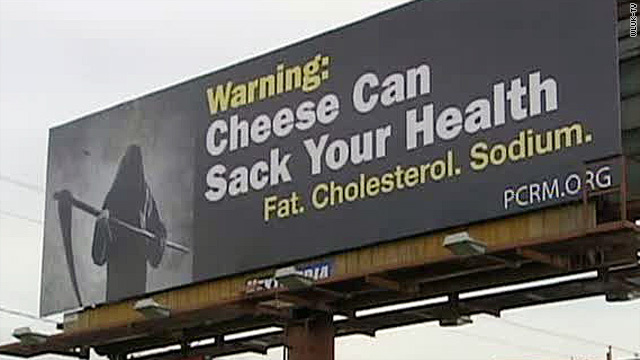 A billboard warning of the dangers of cheese consumption went up in Wisconsin on Tuesday, funded by a nonprofit. That’s the message on a billboard near Wisconsin’s Lambeau Field, home of the NFL’s Green Bay Packers. And yes, that is the same state that leads the United States in cheese production. A nonprofit based in Washington, Physicians Committee for Responsible Medicine, posted the anti-cheese billboard on Tuesday after conquering some legal issues. 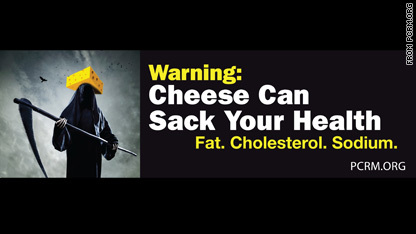 The poster was initially going to depict the grim reaper wearing a cheesehead hat, with the words “Warning: Cheese can sack your health,” to alert passersby who saw the billboard – who would ideally be football fans, according to PCRM.org. However, Foamation Inc., the company that manufactures cheesehead hats, threatened a copyright lawsuit, forcing the organization to remove the cheesehead from its poster, according to the nonprofit’s website. The PCRM billboard had the grim reaper wearing a cheesehead hat before manufacturers insisted it be removed from the poster. Physicians Committee for Responsible Medicine said the focus is on health issues. Susan Levin, nutrition education director for the physicians committee, said in the release. But registered dietitian Roxanne Denneau told affiliate WLUK-TV, "Cheese is not going to sack your health alone. No food by itself is potentially going to sack your health.” The key, she said, is moderation. "I think most consumers understand this for what it is,” said Wisconsin Milk Marketing Board member Patrick Geoghegan, according to affiliate WBAY. “It's misinformation - it’s typical of what PCRM does." Green Bay Mayor Jim Schmitt doesn’t seem impressed with the tactic either. But the nonprofit wants the billboard to be visible to fans driving via Route 41 to Sunday’s football game at Lambeau Field, as the Packers face the Denver Broncos, in hopes of influencing a lifestyle change. eveeryone loves good cheese. it is yummy. No, because then they would say that the excess of fiber is harming our colons, or something. I miss JIF, too, Jazzy. CSinSC also. This is so stupid. Cheese is not bad for you – like anything else, it should be eaten in moderation. And cheese is not an overwhelming contributing factor to child obesity – or obesity in general. The culprit is really junk food and fast food – if you really want your child to eat healthy (or yourself to eat healthy) don't eat processed crap. Of course this includes processed cheese as well, but to target cheese in general? That's just really dumb. Really! There is more pressing issues in the world like the Black Out of the media on Reporting on the WALL STREET PROTESTORS! These people have been beaten, pepper sprayed, punched, dragged, held without charges off and on since Sept. 17th, 2011 when they occupied wall street in NYC. They protest while Wall Street cronies sit and toast with champagne above.. seriously.. I am not joking.. Look it up on YouTube, FB.. it is real and why the media is NOT reporting on this is totally a SHAME! This is NEWS!! People are tired of Wall Street playing with their money, jobs, etc.. If you are reading this go to youtube watch and then tell the media mongols to report on this!! The WALL STREET PROTESTORS!!!! !.......let them eat......CHEESE!!!!!!!!!! Side note – The PCRM is a striclty Vegan organization. They have a hidden agenda that has nothing to do with concern for obese kids. What if they just wear the cheese and not eat it ? Is it still a health issue ? Well folks please look over the tirade I am about to go on. My high horse is waiting for me to climb aboard. Why won't all these government officials and medical experts just admit to the fact that what is causing all the problems with the food we eat, is all the man made chemicals and other crap they are putting into our food. I mean look at what they are feeding and injecting into the animals. Rapid growth hormones, antibiotics, presevatives and god knows what else. Cheese has been a staple since civilization has existed. Why now all of a sudden has it become a health issue. Granted the government insisted they had use this method in order to keep up with the feeding of the masses. But in doing so, they have exposed the masses to medical risks that didn't exist decades ago. So instead of just acting like we are all stupid, please just tell the truth. OK, I'm down off my horse and have put her back in the barn. Just one more thing to blame rather than put the blame where it belongs PARENTS and the lazy fat trolls they produce. I believe the populations of Wisconsin and the Netherlands are comparable as a baseline. The Dutch probably eat much more cheese per capita, and also have one of the longest average lifespans in Europe. The difference is not genetics or diet but the level of routine, daily activity, not just formal exercise. The governor is right, the doctor is wrong. This coming from a nurse with lifelong struggles with weight. It's the activity level. Period. I had a grilled cheese sandwich for lunch today. It was delicious. Am I going to die? I don't think so. I hate busy bodies who want to interfere with other people's pleasures. Besides we all need some dairy foods in our diets. Heck, even the government says so! Physicians Committee for Responsible Medicine - this must be one of the dumbest group of doctors to date. Can one of these brilliant doctors tell me if they would say this same advice to a CF patient who requires high calories, high fats, high sodium simply to stay healthy. To often the doctors that try to shape american health care are the same ones that could not survive operating a practice in the real world - they are academics and not very pragmatic. Please let me know the names of these doctors and let them tell my kids (CF patients) this advice. I could enjoy a good retirement from a malpractice suit. There are too many doctors that should not be practicing medicine nor opening their mouths. Good gravy! Cheese in moderation is fine. You can have fat or carbs, but not both. Follow this and stay away from highly processed junk. I would love to hear these yahoos attempt to debunk the success that people maintaining the high protein lifestyle are having. Hmmm, Wisconsin Milk Marketing Board member Patrick Geoghegan doesn't have any sort of angle or bias, does she? Why even bother getting a quote from a pro-dairy firm on an anti dairy issue?